I have an enthusiastic affinity for food festivals – barbecue, ice cream, chili, Moon Pies. You find it, I’m up for a weekend trip of arts and crafts booths, live music, and cooking and/or eating competitions of any form. I think my fondness for these most basic culinary celebrations was instilled in me at an early age when my family decided to make yearly pilgrimages to the Trigg County Country Ham Festival in Cadiz, Kentucky. We went under the guise of visiting my grandparents who lived in the small rural community at the most western tip of the state. But really, my dad was going for the country ham and despite my mother’s eye rolls when Dad began enthusiastically packing up the family in the car each year, she secretly loved the weekend celebration too. My early memories of Ham Festival vacations are fond ones – talking my parents in to buying me a bunny (which grew into a rabbit and made lots and lots of baby bunnies with my brother’s rabbit), nearly throwing up my corn dogs after too many rounds on the Tilt-A-Whirl, sitting on a straw bale with my grandfather listening to Bluegrass music and eating snow cones. There may even be photographic evidence in existence of me chasing around a baby pig in a ‘Sack the Pig’ contest that was one of the highlights of the festival until animal rights activists declared it inhumane and officially nixed it from the weekend lineup (the photos are well-hidden too, by the way). Last year, my younger brother and I went back to the Ham Festival for the first time in many years. And it was … exactly how I remembered it. Cured country hams still hung in a tent near the courthouse on Main Street waiting to find out if they were grand-prize winners. Carnival rides and games still filled a nearby park, arts and crafts booths lined the streets alongside food vendors offering deep fried everythings (Snickers, Twinkies, pickles, etc). But perhaps the finest tradition of the Trigg County Country Ham Festival is its claim to fame: The World’s Largest Country Ham and Biscuit. Yes, you read that correct. It’s the world’s largest. It’s Guiness Book-official. 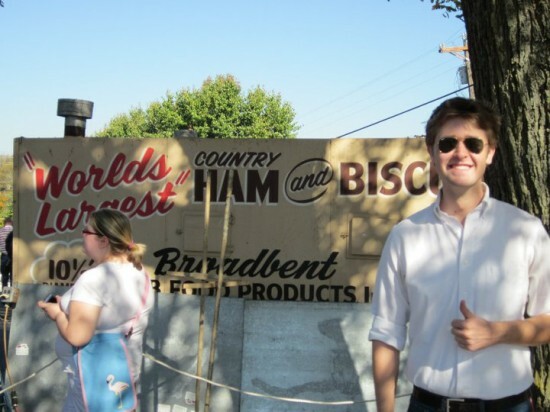 The huge biscuit debuted in 1985 during the 9th annual Ham Festival. It was 4,000 pounds. A crowd of over 15,000 people were on hand to view the biscuit and parade in its honor grand marshalled by University of Kentucky Basketball Coach Joe B. Hall. The recipe has since been halved, and each year a 2,000-pound version (10.5 feet in diameter) is baked in a custom-built oven and removed by fork lift during the festival. The recipe includes 150 pounds of flour, 2 pounds of salt, 6 1/2 pounds of sugar, 39 pounds of shortening, 39 cups of water, 13 gallons of buttermilk. Add 16 large baked country hams and it is served to the masses. The 35th annual Trigg County Country Ham Festival is this weekend (Oct. 14-16). To learn more about the history of the event as well as a schedule of events and directions to the festivities, check out the Ham Festival’s website. I hope to run into you in line for the Tilt-A-Whirl! (I’ll be the one with a country ham biscuit in each hand).